Not many years ago, when I lived in London, I was voting in the Mayoral election or the like. It might have been an MEP election. I can’t recall. But it was a PR election because I’m certain I voted Green as my second preference. Why did I vote Green? I couldn’t tell you that exactly. A Green vote seemed like a good idea. Obviously, I’m concerned about climate change and sustainability. It felt harmless. 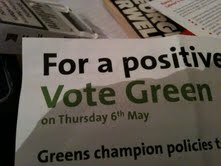 I voted Green because I care about small g green issues. Thankfully, I have learnt so much since then. I’ve learnt how the Greens desperate campaigning organization. The Green Party will say anything to get a vote: they won’t even admit to their true position on drugs. We’ve seen that and more in Brighton Pavilion in the past few weeks. The Greens are chameleon and disingenuous. And policy. The Greens oppose economic growth. Greens will accept an ongoing recession. I like economic growth: it’s how we increase the fortunes of working people and address the issues of inequality. I’m proud that Labour has improved income inequality over the past 13 years. I voted Green once because I was ignorant. They seemed fluffy and safe. I was so wrong. The Greens are an ambitious, self-serving pressure group with bizarre ideals. Take a look at their manifesto. Your vote is valuable. Check out the policies of any party you are voting for. You may be surprised. Why don’t you talk about Labour’s policies rather than continually trying to mis-portray our policies? Everyone can see Green policies in our leaflets and websites. So far the verdict is that people like what we stand for. Unlock Democracy/Charter88 has Greens top-ranked (with the LibDems ahead by just 0.5 points) for our policies for democratic reform. http://votefordemocracy.org.uk but as you say, in Brighton LibDems are not a force. They all seem to have moved to Lewes where I hear Norman Baker is a bit worried about the Tory challenge. As for drugs, the British Medical Association and the general secretary of the Royal College of Nursing have the same views as Greens – They want to treat addiction as a health issue before it becomes a criminal issue. …surprised you didn’t mention the bookies. Re drugs policy: has that been on any of your leaflets? None that I’ve seen. You have offered not a single counter to Dan’s email – just links to people who love you. And that’s not going to sway a genuine voting floater, I mean floating voter, like me in Pavilion. Dan’s posting is rousing and focuses the mind on the direction Greens want to take. I really admire your transparency and commitment to social justice. But I have read your manifesto and have been uneasy ever since about your sinister dislike of wealth and choice. Impressed as I am about the way you’ve tackled anti-social behaviour by individuals and the big stores in your ward, I’m wondering what sort of world you want this one to become? Should we eschew wealth? How about big cars and big houses. How about cities? Maybe we should roll the world back to the Year Zero. Would that make us all happy and fulfilled? How come my profile pic doesn’t show? No I don’t want people to eschew quality of life, the ability to improve themselves or succeed in business. Those are all important to me and the Greens. On growth essentially what we mean is this obsession with growing GDP is not the right way to manage or judge our nation. This is not as unusual or radical as some like to portray – it’s actually an increasingly common viewpoint amongst economic, social and political scientists. I think most people would agree that not everything in life can have a monetary value put on it. This isn’t to say that we don’t want a strong economy – we absolutely do, which is why we propose (for example) cutting corporation tax for smaller firms. Being Green is about having a positive view for the future. No more industrial age thinking of mass production and mass pollution, it’s about quality of life, it’s about sustainable, green technologies which create jobs, improve air quality and keep our homes warm. Not ‘back to the Year Zero’ but to something better. I’m a Green because I care about tomorrow. The reason I joined the Green Party is because Caroline Lucas actually stands for something, and says it, and that’s so rare in politics these days! And it was actually when she said economic growth should not be the ultimate goal of our economic policy. Most people realise on an individual level that more money doesn’t necessarily make them happy, so why do we think that without national policies??? Politicians are told when they go into interviews “don’t make the headlines” thats why they very rarely actually say anything. Caroline Lucas is brilliant and you can see it throws the interviewers when she actually answers their questions! I loved it on question time when Starkey accused Caroline of Green Socialism and she replied, “I’m very proud that we have socialist principles”. BG – you need to use the same email address on your comment as you signed up for on Gravatar. Otherwise the pic won’t show. If you used a different email address here, you can add that in to Gravatar and it should show up. Election Notes 20/04/10: What does the LibDem surge mean in Brighton Pavilion?